Green Fairy Quilts: Happy St. Patricks Day! If you are prone to gag with gross food, you may not want to look! So, it's St. Patricks Day, big whoop in my view! I am not the best at celebrating every holiday, but Clint insisted that it would be fun to have green food for the kids because it is St.Patricks Day, after all his mother always did it for him! Anyway, I have to admit that I am not the best cook, in fact I am terrible! 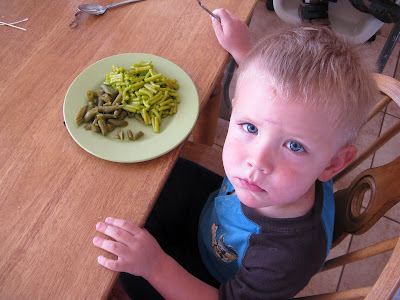 I admit I make macaroni and cheese from a box and green beans from a can, I feel so bad for my kids! 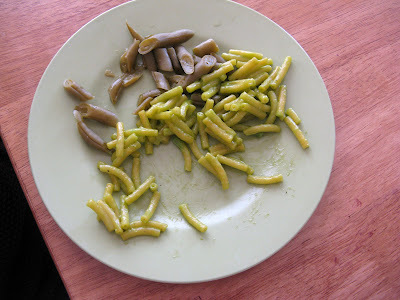 So, for your viewing pleasure or displeasure here's our green lunch. I think I want to gag! Lili was really excited about it, she was amazed the mac and cheese tasted the same! Go food coloring! Micah was not as thrilled, but with some convincing from Lili he gave in and ate all that was on his plate! Jonah didn't care, he's just my chubby baby that will eat almost anything! Forgive me for the nasty food pictures, but I hope you have a great St. Patricks Day, whether or not you celebrate it! they are too stinkin' cute! 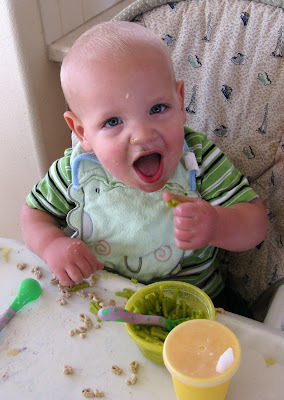 I think I am going to try the green food coloring on the mac n' cheese next time! How can you not give a big woop about St. Patty's...you're really letting me down here Jude! I'm glad Clint convinced you to get the ol' food coloring out...classic look on Micah's face! I still like the box mac and cheese and I'm a grown up! 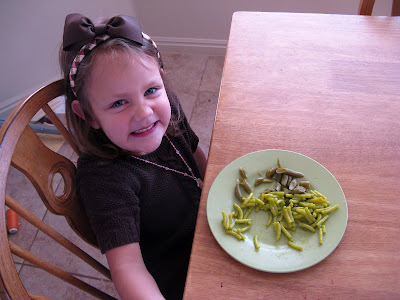 Although I do prefer fresh or frozen green beans and rarely eat canned. I have never added green coloring though :) bet the kids had fun with it and that is what counts. tee hee that's fun!! Glad they all ate! What? The GREEN Fairy isn't all about St. Patrick's day? Oh my goodness! And may you learn to LOVE the Green of St. Patrick's day. I love their different expressions - too cute! We took green food in to work today, my contribution was green grapes. The easy way out, I know, but I love grapes! Happy St. Pat's Day to you, too! Kids, you gotta love them! Green foods, Yuck! Like Gene said, glad that you let the green fairy into your home. We had green ice cream...You have to love the colour green...Ireland is blessed with green everywhere.